Term: Full-time, permanent 35 hours/week. Evening and weekend work. Flexible schedule. Start Date: May 1, 2019. As part of grunt gallery’s succession plan there will be a one year overlap between the incoming Program Director and the outgoing Program Director. 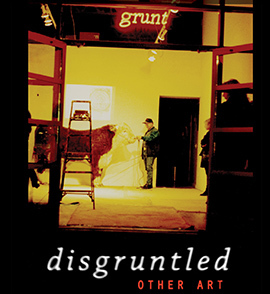 Formed in 1984, grunt gallery is an artist-run centre located in the Mount Pleasant neighbourhood of Vancouver, BC. grunt gallery has built its reputation on innovative programs that showcase current and past work by contemporary Canadian and international artists. Working with a wide range of collaborators, grunt gallery confidently supports interdisciplinary projects, performance, media works, publications, websites, artist talks, research residencies, mentorships, publicly-sited projects and socially engaged initiatives alongside gallery-based exhibitions. grunt gallery continues to provide space for artistic agency, diverse perspectives, unruly practices and community connection. • The Program Director supports the organization’s mandate, public image and shares the overall mission and vision with the Board of Directors. The Program Director maintains the gallery’s relationships with donors, foundations, members, artists, patrons, stakeholders and the general public. • The Program Director is the conceptual visionary of the organization, which includes fundraising and grant-writing, and should have extensive familiarity with local, national and international art communities. • The Program Director is responsible for developing key connections to determine, develop and coordinate the annual programming of grunt gallery. In addition, the Program Director oversees work related to grunt gallery’s archivist and digital/physical archives—a key attribute to this work is activating grunt’s rich history and connecting it to ongoing programming. • The Program Director works closely with the Operations Director to provide insight on overall direction and initiatives undertaken by the organization to ensure that key stakeholders and overall capacity of the organization, in consultation with the Business Manager, may be met effectively and collaboratively. The Program Director reports directly to the Board of Directors and is one of two senior members of the employee team. • Building grunt’s community reputation via networking, development and community engagement. • Developing programming budgets and working with the Grant Writer to secure funding, through donors, foundations, public funding and private sources. • Meeting regularly with staff and the Operations Director to ensure clear communication regarding programming, projects and development. • Providing leadership and guidance to the curatorial committee to determine exhibition-based programming and projects. • Liaising with artists to determine programming possibilities within grunt’s exhibition space and beyond the physical facility. • Attending Board of Director meetings to provide programming and budget updates. • Providing effective leadership and insight to the Communications Director to promote grunt’s history, programming and growing expanse of projects. • Working with the Archives Manager to determine potential funding and programming to continue the development and operations of the archive. • Evaluating annual programming in collaboration with grunt’s staff. • Ability to work collaboratively with permanent staff; project and/or contract and remote staff. • Exceptional communication and coordination skills to ensure knowledge and comprehension of complex project planning can be effectively understood. • Understanding grunt is a people-centred work environment that respects a variety of working styles, primarily independent, that thrives on communication to allow for creative autonomy and decision making amongst staff. • Critically relevant curatorial experience with knowledge of diverse communities. • Proven success with art programming and an excellent reputation within the art community, built on previous success, rapport with artists and the ability as act as a visionary. • Excellent understanding of artist-run centres and non-profit policies and requirements. • Proven ability to write grants. • Strong working knowledge of financial development and reporting practices. • A working intercultural skill-set to effectively work with a diverse group of staff, artists and community members, and a history of engagement with Indigenous and LGBTQ2 people. • Preferably a post-secondary education in an arts related field. • Confident problem-solving abilities. This applies to responding to unforeseen circumstances in a calm and strategic manner; plus, the ability to problem-solve issues that may arise with staff to maintain respectful relationships that encourages continued productivity. • Must be highly organized, detail oriented, committed to quality and able to work independently with minimal supervision. • Experience in public relations, media relations, communications and community outreach. • Proven responsible financial management experience with demonstrated cost-savings and working within budgets. • The Program Director must promote and set the example for ensuring a friendly, courteous, respectful and professional workplace. • The Program Director must act in accordance with the grunt Workplace Relationship Policy, which prohibits the acceptance of gifts, loans or anything of value from any individuals with whom contact is had during the course of employment. The preferred file format is PDF. Application Deadline: February 28, 2019 @ 5:00pm PST. Only those shortlisted will be notified. This position is subject to a six month probationary period. grunt gallery is located on the unceded, ancestral, and occupied, traditional lands of the xʷməθkʷəy̓əm (Musqueam), Səl̓ílwətaʔ (Tsleil-Waututh), and Skwxwú7mesh (Squamish) Nations of the Coast Salish peoples.